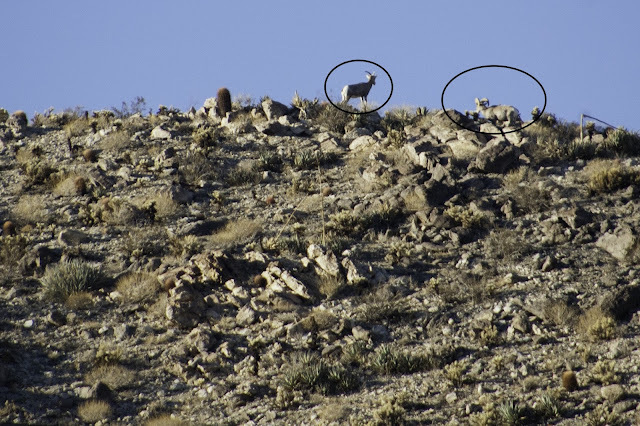 I tend to go on-and-on about how Anza-Borrego Desert State Park is a great spot to see bighorn sheep. We hoped to see at least one on our way down Montezuma Grade, which as I have written before, is a prime bighorn observation point. Indeed, in February 2009, while going up the Grade, we saw a huge bighorn ram watching over the valley. 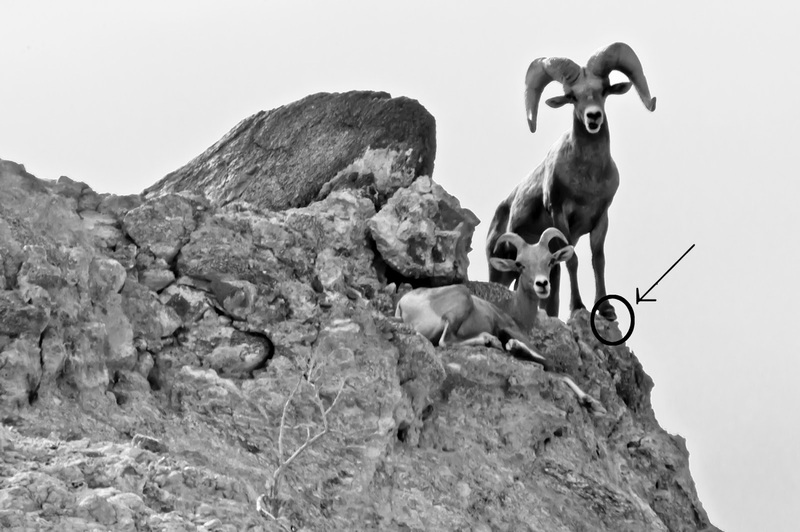 February 2009 Ram Sighting - "King of the Desert"
This time, going down the Grade, however, we wound up seeing zilch and mainly only saw the fire damage from the late August 2012 wildfires. At the base of the Grade, we drove through deserted Borrego Springs. This tourist spot was pretty dead and will have a totally different vibe come winter. No, it won't be filled with ski-bunnies and snow-boarders. 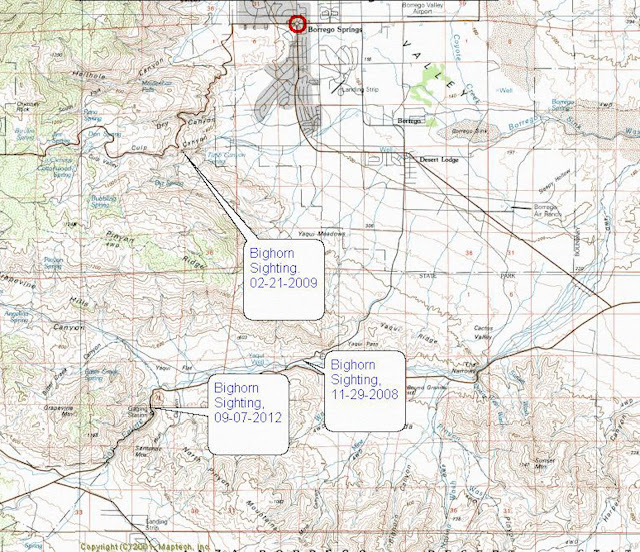 But, with the winter temperature rarely exceeding the more tolerable 70F, the desert will be filled with hikers and off road vehicle drivers. Now, it is just still way too hot for anything. At Christmas Circle, we swung south out of town on our way to Julian. 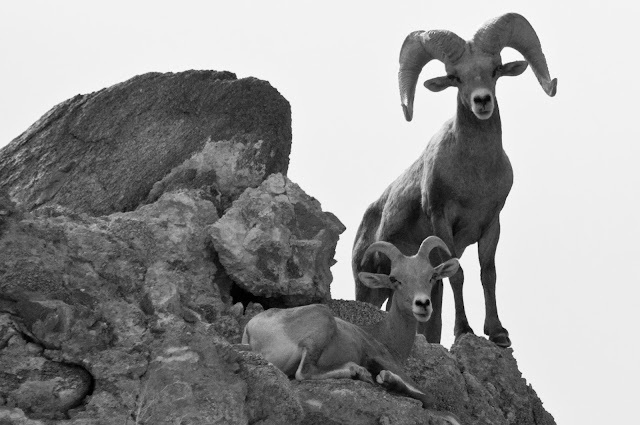 Yaqui Pass is another place to spot the bighorns. However, as the pass is quite tight with almost no places to pull over, photography is difficult. 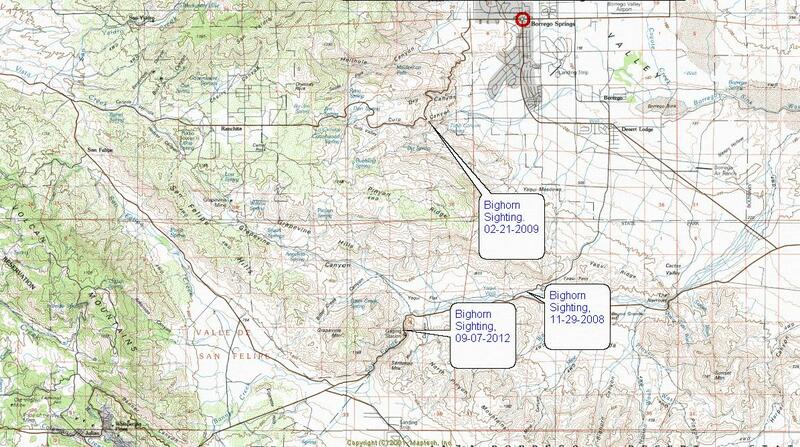 We did spot a ram and ewe in this general area back in November 2008. Now, I was sitting in the back seat of the truck, with Joanie and her mom sitting upfront when Joanie let out an "I saw one" scream. Of course, by that time, we went through an S-curve that totally blocked our view of the bighorn. So, at the base of the hill, she stopped, I took out my camera and the biggie lens and got back in the truck. It was hot and dusty out and the "closed for the season" campground had a sign warning that the closest open bathroom was in Borrego Springs. We headed back up the hill, with no bighorns in sight. At the first turn-around, that is what we did, and we crawled down the highway, much to the chagrin of aggressive motorcyclists. We finally spotted the ram way up on a ledge. How Joanie sees these things is incredible. We pulled over the best we could and I snapped away. 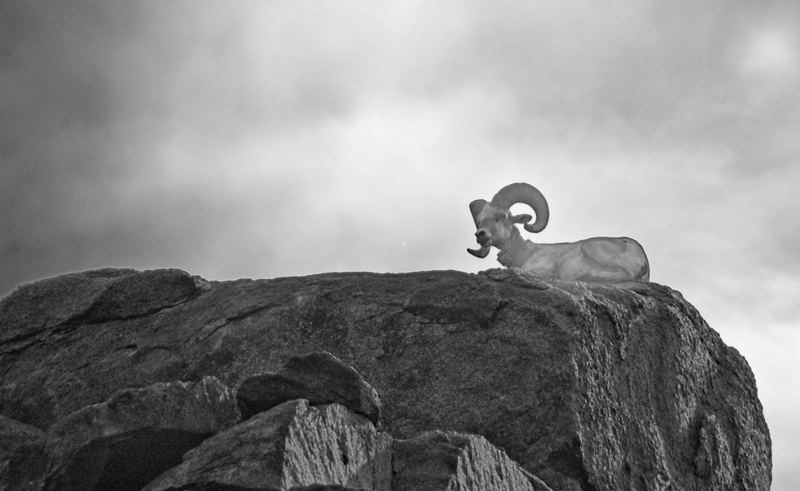 Even eyeballing the ram way up on the ledge, we could see it was with an ewe. Between the idling truck, my unsteady hands, and the difficulty of hand-holding a 600 mm lens, I was kind of down on the whole sighting and not expecting much from the pics. I raised the ISO of the camera to 1000, hoping for a sharper pic. 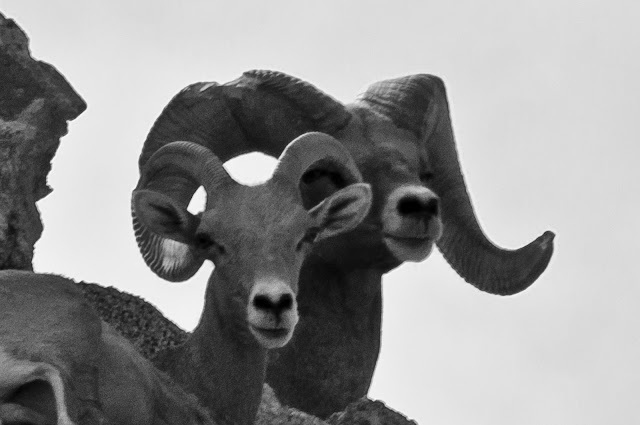 As with the earlier ram sighting described above, these bighorns were in a terrible position for photographing; back lit. Post-processing the images to bring out the details made the colors somewhat unnatural, so I converted them to b&w. 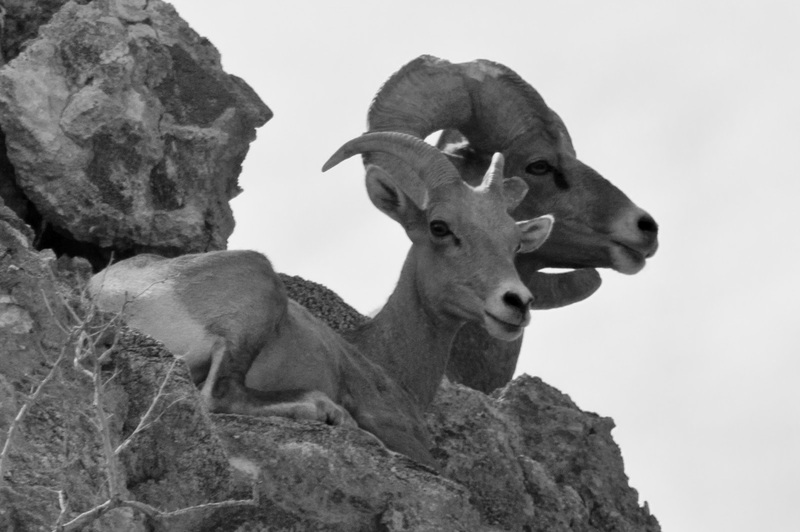 September 2012 Ram and Ewe Sighting - View showing how close to the edge these guys can get! Just as we pulled away to continue down the hill we were pulled over by a heavily armed, well armored cop of some type (there is a heavy Border Patrol at certain parts of the park). He reminded us that pulling over in this area was very dangerous (yeah), but let us go without a ticket. Next stop was Julian and some ice cream. For those keeping track or out looking for the bighorns on their own, here is a summary of our sighting locations and good places to start your search.